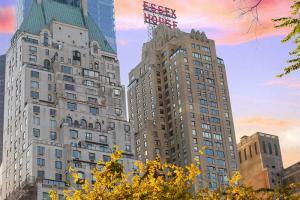 Revel in refined luxury at JW Marriott Essex House New York. This upscale Manhattan hotel sits adjacent to Central Park South and is minutes from Lincoln Center, Fifth Avenue and well as numerous other NYC attractions. Well-appointed rooms and suites boast Art Deco touches, plush bedding, marble bathrooms and Wi-Fi access. Spacious family connector rooms and suites benefit from expanded living areas, and suites with terraces overlooking Central Park are available, as are pet-friendly accommodations. Rejuvenate at PRIMP spa, break a sweat at the fitness center or enjoy fine dining at SOUTHGATE Bar & Restaurant before stepping out to explore. This hotel is 10 miles from LaGuardia Airport, and 17 miles from Newark Liberty International Airport.